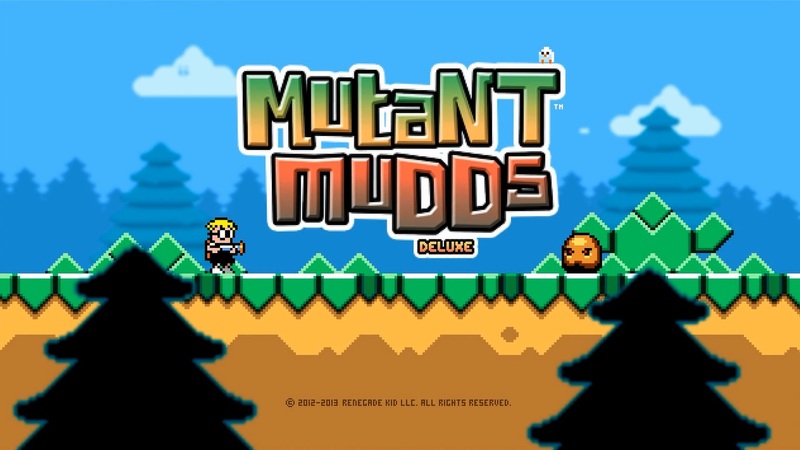 Mutant Mudds Deluxe is a game that I got on PlayStation Plus and while it took me awhile to get to it, I finally got the chance to do so and I ended up really enjoying the game, a lot more than I expected to. Like most 2D platformers, the mechanics are simple. Left analog stick to move, X to jump, X again while jumping to float, and square to shoot. 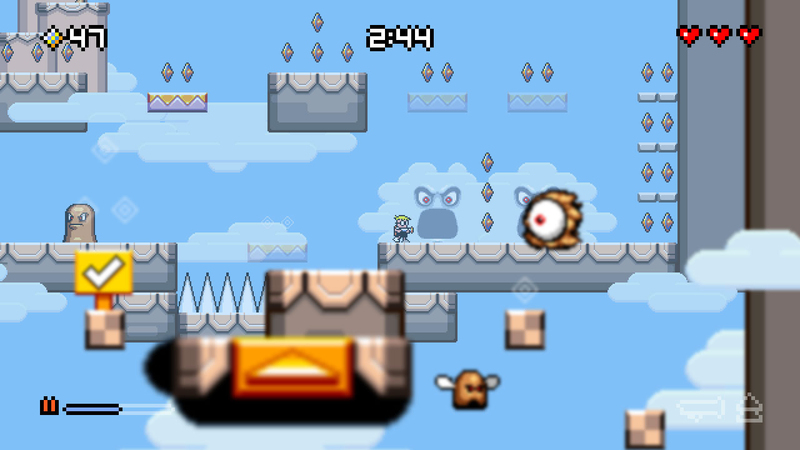 Each level is pretty short with a 4 minute timer which is reset when you die. Part way through the level there are checkpoints that you reach where if you die after that, you will respawn at the checkpoint with the same 4 minute timer. 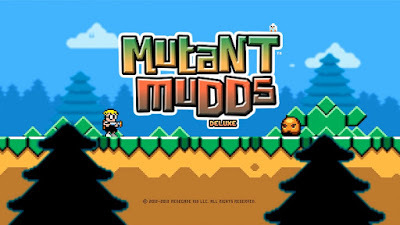 You run around and you shoot water on mud monsters and there is a variety of them, but none too difficult. As you progress through the game you unlock three different power-ups that you will uncover as you play through the game and you will find that you will swap through either extended hover (extends your hover time) or power shot (makes you shots more powerful) since they seem to be the most useful. The last one, vertical boost, is for accessing certain areas within levels, however I didn't find that it helped me pass levels much. You begin the game in a hub where you see a bunch of doors (20) and you enter them to start the level. 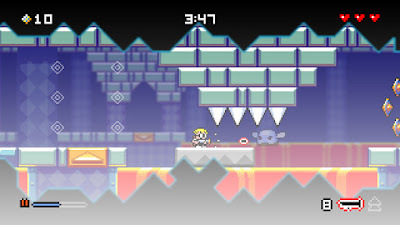 In each level, there are 100 diamonds in the level, which you collect in order to unlock the three power-ups. When you complete the level, all diamonds that you collected are saved and you only need to collect the missing ones in the future which adds to the replayability of this game. You can complete the game by just playing the initial set of 20 levels, however, you will notice that there are three symbols at the top of each door. The small symbols means that you have collected all the diamonds in the level, the big symbol means that you have collected the water sprite within that level, and the final symbol means that you have completed the hidden G-Land / V-Land levels. If you are interested in more content, you need to collect all the diamonds, all the water sprites and complete all the G-Land / V-Land levels which unlocks Grannie who has another set of 20 levels which are similar to the initial 20 levels but harder. So there is a lot of content in this game even if it doesn't look that way at the beginning. Once you have completed all of that, there are also secret characters that you can find within the game that allows you to use them, however, they are just palette swaps with no real difference in gameplay unlike Grannie who can use all three power-ups at once. I played and finished the game during my eastern Europe trip and while it was frustrating for some levels, I didn't feel that the game was cheap with my deaths. 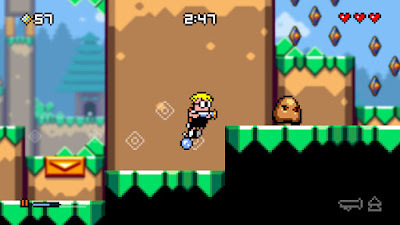 If you are looking for a 2D platformer, I don't think you can go wrong with this one. Come back next Wednesday where I will give my Final Thoughts on Sounds Shapes for PlayStation Vita.